Highly versatile, the Airocle E Series louvres used either as a second stage to any of our single stage louvre systems, or as a stand-alone full ‘chevron’ louvre system. Used as a full chevron system, E Series louvres not only provide 45% of free open space and therefore maximum airflow, but they also guarantee optimum privacy when required. Airocle’s E Series of ‘chevron’ louvre natural ventilation systems are applicable across a wide range of projects, including industrial, commercial and community uses. Chosen to act as a second stage to any of our single stage louvre systems, E Series is an ideal solution for buildings, which need a weatherproof environment. Second stage louvres are especially beneficial for building exposed to the elements. When utilised as a full chevron louvre system, E Series louvres provide an added layer of privacy and are therefore perfectly fitted for apartment blocks’ windows and balconies or industrial/commercial projects, where hiding of unsightly plant or equipment is required. Specifically designed to counter the problem of wind-driven rain making its way into a building’s structure, E Series louvres ensure total weather protection. When specified as a full ‘chevron’ louvre system, E Series add an additional element of privacy. E Series louvres meet all relevant building standards and are environmentally-friendly, promoting a sustainable future. Made of the highest quality materials, E louvres are customisable in size to a maximum blade span of 1800mm. Depending on the project requirements, blades can be mounted vertically or horizontally. Airocle’s E Series ‘chevron’ louvres are simple and easy to install. All units are shipped completely packed-down with all necessary fixings and specified accessories. Our team of ventilation experts is on hand to help pinpoint the optimum natural ventilation to suit your requirements. Simply, Contact us for obligation-free advice. 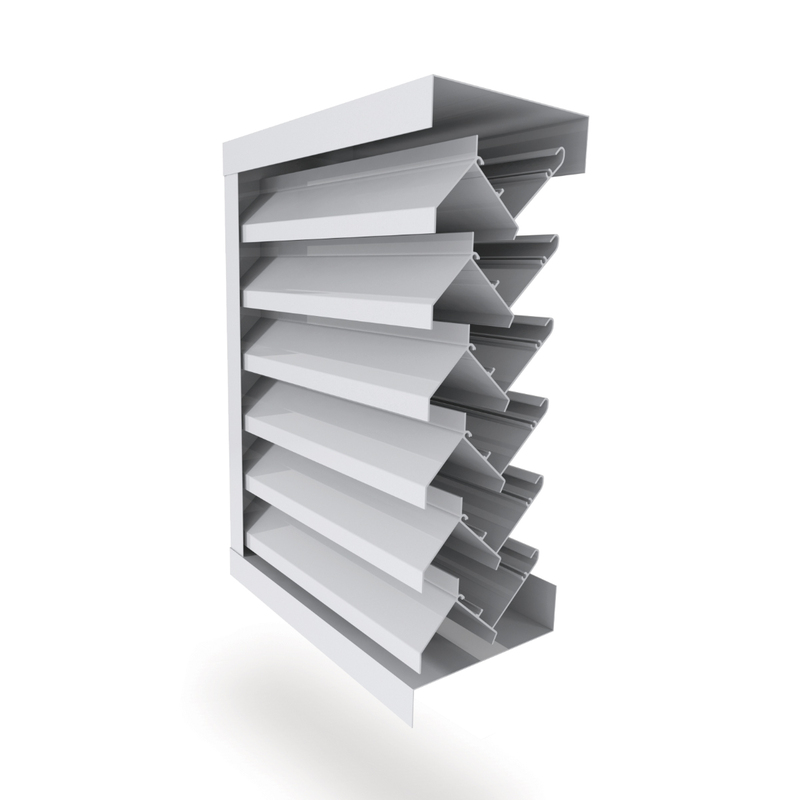 Once installed, E Series louvres are subject to virtually no running or maintenance costs. This means they’re an extremely economical and cost-effective ventilation solution.